When you are in need for a professional level look for your chocolate bars, Business Image Printing has the resources and experience to give you just so. Let us give your product the attractive, delicious look it deserves in today’s market! It’s time to take your business to the next level and to give your products the wonderful design and packaging it deserves. 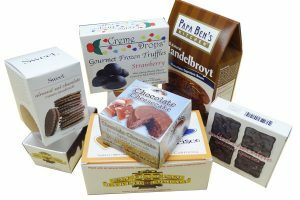 At Business Image Printing, our custom printed chocolate boxes and packaging will allow you to have control over how your product looks. Business Image Printing is proudly equipped with knowledge and experience to handle the chocolate boxes you need as we can boast a large variety of different styles and designs that has become staples in chocolate packaging. We can provide you the top-quality custom printed chocolate boxes and packaging designed to match your personal tastes. It is important that your custom printed boxes can compete with other products and with the addition of professionally-made custom printed boxes to go with your products, we are certain that your customers will know which brand they should choose from. We ensure you that our high-quality printing services will produce an optimum final product, emphasizing your brand. Furthermore, if you are looking for even more customization packaging, our team is glad to make your product stand out among the competition by adding a UV coating to your product boxes for that extra shine, embossing the packaging in order to add a elegant and artistic element to your products, as well as foiling your packaging to stylize your product even further. You can be certain that Business Image Printing is readily equipped to elevate your product to the next level.